This week marked a historical event in Prunella’s Workshop’s history. We had our first tour, demonstration and lesson. Boston Handmade members joined us on this momentous occasion and managed to convince me it can be done. Not only is it possible, it was a lovely experience. Our shop space is limited. Our room had to be divided in half to provide an adequate safe place for a toddler to play during the day. While many crafts are possible with a toddler directly under foot, we work with oxy-propane torches. Having a child grab your elbow at an inopportune moment is not a great plan. That said, our space is planned out efficiently to maximize the number of tools available to us. After pleasant conversation over refreshments in the playroom, we adjourned to the studio, where I introduced Boston Handmade to my workspace. 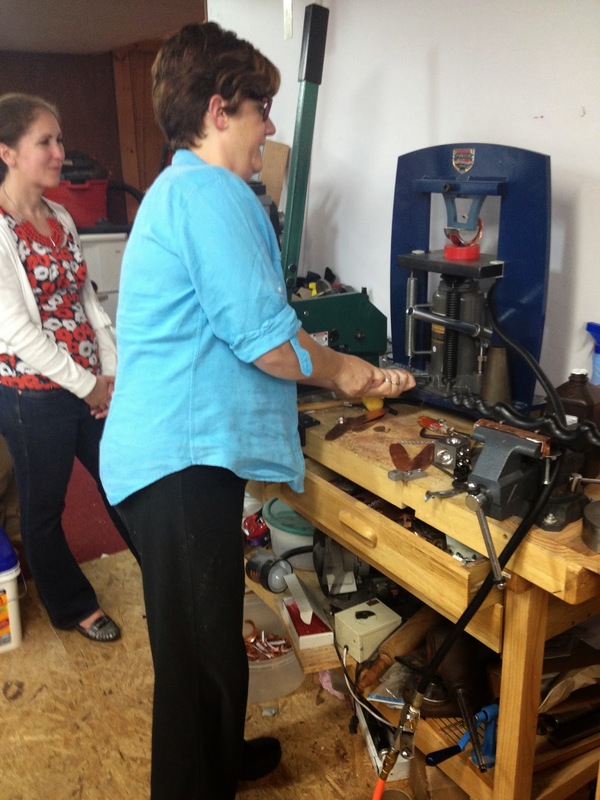 I handed each lady a copper bracelet blank, explaining that, while not fully annealed, the blanks were not work hardened. Annealing is the process of heating up the metal so it is soft and pliable. The metal becomes work hardened as we work it with hammers, and if it is worked too much it can become brittle and break. I invited my guests to bend the metal with their bare hands. A common misconception is that metal will not bend as it is cold and hard; as such timid hands will not bend the bracelet. I demonstrated the metal would bend quite easily, and could easily be hammered flat again. I proceeded to demonstrate the use of the hydraulic press. While the bracelets could be made in their entirety without the press, I wanted to to show this quick and easy process. Yet another eureka moment occurred when they realized the nylon the bracelet was formed into was quite solid. When in action, the pressure of the press squeezes the nylon in such a way it appears almost as soft as jell-o! I did a quick annealing demonstration in which I showed how to add a hammer texture and the process of making the bracelet without the press. The real fun was to follow! Jill of Early Bird Designs showed us what she had learned by making a bracelet of her own she was able to wear home. There is nothing like watching someone learn something entirely new. Jill was a great sport, and she made it look really easy. That was when I made my deep dark confession. I too had never made a bracelet using the hydraulic press before, as typically this is my partner’s domain. All in all, this was an interesting learning experience for me. While I am comfortable with my processes, I had never branched out into teaching prior. I wasn’t entirely certain how it would pan out, but I was confident my Boston Handmade team would be patient with me should my plan not work out as intended. I learned I needed more time! These experiences never play out exactly as I imagine in my head, but I am pleased to say it was fairly close. Have you ever done a demonstration/lesson in your studio? How would you prepare?